More than three million dogs and cats die in shelters a year. That statistic is unacceptable to me, and quite frankly, embarrassing to our culture. We can do better. 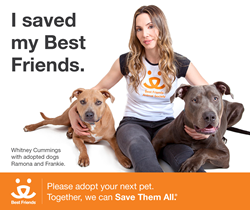 Comedian, actress and writer Whitney Cummings is perhaps best known as the co-creator of the CBS series “2 Broke Girls” and creator/star of ‘Whitney’ but this lady with a sailor’s mouth has some truly choice words about how we need to do more to help the homeless dogs and cats in America’s shelters. Cummings joins Danny Trejo, Carrie Ann Inaba, Denise Richards, Nils Lofgren, Josef Newgarden, Amanda Seyfried, Cecily Strong, Maggie Q, Elisabeth Rohm, Lisa Edelstein, Tricia Helfer, Emmy Rossum, Michelle Beadle , Jack and Suzy Welch, Mike Rowe ‎ and Allison Janney among other luminaries ‎participating in Best Friends’ photo campaign featuring celebrities posed with their personal rescued dogs and/or cats in support of the Save Them All ‎call to action. Best Friends Animal Society is the only national animal welfare organization dedicated exclusively to ending the killing of dogs and cats in America's shelters. A leader in the no-kill movement, Best Friends runs the nation's largest no-kill sanctuary for companion animals, adoption centers and spay and neuter facilities in Los Angeles and Salt Lake City as well as lifesaving programs in partnership with more than 1,400 rescue groups and shelters across the country. Since its founding in 1984, Best Friends has helped reduce the number of animals killed in American shelters from 17 million per year to an estimated 4 million. By continuing to build effective initiatives that reduce the number of animals entering shelters and increase the number who find homes, Best Friends and its nationwide network of members and partners are working to Save Them All®.